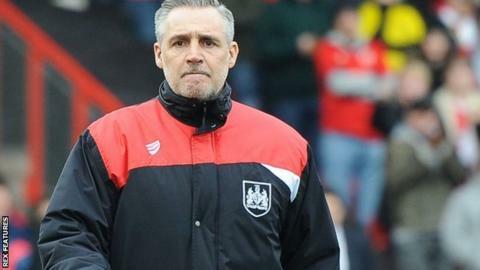 Interim Bristol City boss John Pemberton says he would consider accepting his first job in management if approached to take permanent charge. The 51-year-old, alongside Wade Elliott, led City to a 1-0 win over Middlesbrough on Saturday, two days after Steve Cotterill's exit. Pemberton has been assistant manager at Ashton Gate since May 2013, working under Cotterill and Sean O'Driscoll. "I'd consider becoming manager, if it's in the club's best interests," he said. "I don't know how long Wade and I will be in charge, but if it's a week or month or a year there will be no problems from me. "I would definitely like to stay at the club, but in what capacity I don't know." Bristol City's triumph against Championship leaders Boro was their first win in eight games in all competitions but they remain in the relegation zone on goal difference. New chief operations manager Mark Ashton, who was appointed after Cotterill's sacking on Thursday, says the search for a new boss and ways to strengthen the squad are well under way. "Conversations are up and running," he told BBC Points West. "It's very clear we need to bring some players in and we are trying to do that over the next week. "Along with looking for a new manager or head coach that will be my focus. We need some players in and we need some players in very quickly."